Background: Pseudoexfoliation syndrome (PXS) is regarded as rare in people of Chinese ethnicity but the prevalence of this condition is not known. This epidemiology study was conducted to assess the prevalence of PXS in cataract patients and to report the clinical features present. Methods: Prospective descriptive study conducted in the period from March 1999 to May 2001 in ophthalmology departments in cluster hospitals serving a population of about 1.2 million. 500 consecutive patients aged 60 or above attending the general ophthalmic clinics with a presumed diagnosis of cataract were recruited. A detailed examination including biomicroscopy, intraocular measurement, and gonioscopy were performed on all patients. All positive PXS cases were documented photographically. Results: 500 patients were examined. They ranged from the ages of 60 to 91 years old, with a male to female ratio of 1:2. 40% suffered from hypertension while 24% were known diabetics. Only two positive cases (0.4%) of PXS were identified in the study population. 18% of all eyes were found to have narrow angles (defined as grade 0 to 2 by Shaffer grading). Nuclear sclerosis was the single most common type of lens opacity. Conclusion: PXS is a rare condition in Chinese people. A prevalence rate of 0.4% in patients aged 60 or above was identified in this hospital based epidemiology study. To the best of our knowledge, this was the first study conducted in a Chinese population to examine the prevalence of PXS. The prevalence of PXS in various populations were reported to be: England (4%), Germany (4.7%), Norway (6.3%), Eskimos (0%), Russia (12%), Finland (22%), Iceland (29%), Greece (16.1%), Australia (0.98%), and Iran (9.6%).21–25 The clinical, microscopic, and ultrastructural features of PXS in Chinese patients has been described,26 but its prevalence has not been previously examined. Although a weak association between PXS and brown irides was described,27 it is generally considered as rare in Chinese people. The primary aim of our study is to assess the prevalence of PXS in a Chinese population and to report the clinical features present. In addition, information on angle status and cataract types is documented. Patients with a presumptive diagnosis of cataract attending the general ophthalmic clinics at the Prince of Wales Hospital and Alice Ho Miu Ling Nethersole Hospital in the period of March 1999 to May 2001 were invited to participate in this study. A total of 500 consecutive patients were recruited by one of the authors (ALY). Patients who were over the age of 60 years old, cooperative with examination procedures, and who had no previous intraocular surgery in either eye were included. Informed consent was obtained from all the participants and ethics committee approval was granted. Relevant details in medical and ocular history were obtained from each patient. A complete ocular examination conducted on all patients included intraocular pressure measurement, gonioscopy (not indentation), slit lamp biomicroscopy, and dilated fundus examination. Angle width was assessed and classified as narrow for those with Schaffer grade 0–2 and open for those with grade 3–4. Cataracts were assessed and classified morphologically as follows: nuclear sclerosis (NS), cortical (C), and posterior subcapsular (PSC). PXS was diagnosed clinically by the presence of typical PXM on anterior lens capsule or at the pupil border, with or without Sampaolesi’s line and pigment deposition in angle and/or corneal endothelium. All positive cases were photographically recorded. Of 500 patients recruited, 315 (63%) were female and 185 (37%) were male; ages ranged from 60 to 91 years old. Approximately three quarters of all participants were over 65 years old (fig 1). Distribution of ages of study population. Forty per cent of patients had hypertension while 24% had diabetes mellitus. The prevalence of hypertension in the local general population had been reported to be 48% among those aged 70 or above,28 while diabetes mellitus in those older than 65 was reported to be about 25%.29 The participants in our study appeared to be a reasonable representation of the age matched general population. The distribution of the morphological types of cataract observed is illustrated in figure 2. The most common presentation was mixed cataract with both nuclear and cortical elements (>50% of all cases) while NS was the single most common morphology type (present in 99%). 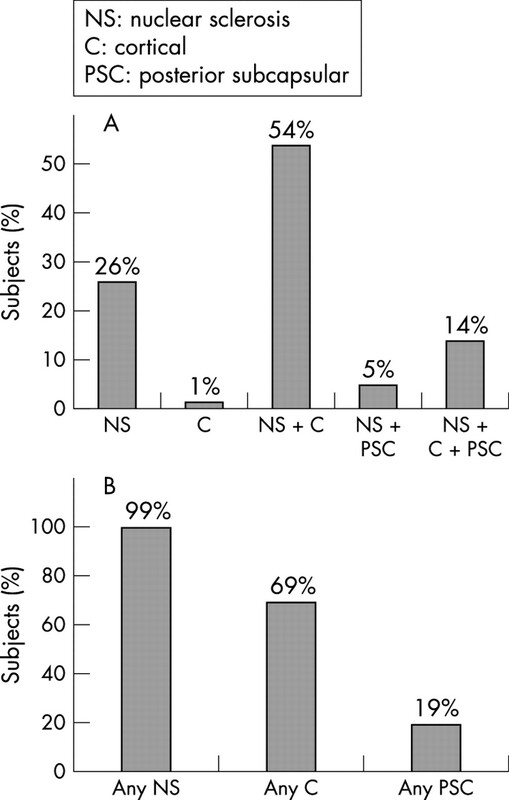 Cortical and posterior subcapsular opacities were observed in 69% and 19% respectively. (A) Distribution of lens opacity type on presentation. (B) The relative frequency of cataract types. Eighteen percent of all eyes were found to have narrow angles. The percentage of narrow angles observed was higher in females than males, at 22% and 12% respectively. The difference was statistically significant (χ2 of independence: χ2 = 16.62; df = 1; p<0.0001). Only two out of 500 patients (0.4%) were found to have PXS. Both were male and aged 64 and 66 years old respectively. They were clinically diagnosed by the presence of typical PXM on the peripheral anterior lens capsule. Both patients had only unilateral ocular involvement, with the absence of any additional features. The angles were open, and intraocular pressure and cup:disc ratios were found to be normal. Both patients had nuclear sclerosis without any phacodonesis. Cataracts are known to be more common in PXS. Ascorbic acid is significantly reduced in the aqueous of cataract patients with PXS.36,37 One may therefore consider the possible association between oxidative stress and UV exposure in PXS and hence the reason for the association between the two. The prevalence of PXS in patients with cataract had been reported to be 17.7%, 23.5%, and 28.7% in Turkey, Portugal, and Spain respectively.10,38,39 In contrast, our prevalence of 0.4% (similar to Eskimos—possibly related to a common ancestry) is much lower in comparison. In conclusion, PXS is a rare condition in Chinese people with a prevalence rate of 0.4% in patients with cataract aged 60 or over. To the best of our knowledge, this was the first study conducted in a Chinese population to assess the prevalence of PXS. Lindberg JG. Kliniska undersokningar over depigmenteringen av pupillarranden och genomlysbarheten av iris vid fall av aldersstarr samt i normala ogon hos gamla personer [Thesis]. Helsinki, Finland: Helsinki University, 1917. Prince AM, Ritch R. Clinical signs of the pseudoexfoliation syndrome. Ophthalmology 1986;93:803–7. Fukisawa K, Sugai S, Inomata H, et al. Relationship between intraocular pressure and age in the exfoliation syndrome. Ophthalmologica 1995;209:199–202. Davanger M, Ringvold A, Blika S. Pseudo-exfoliation. IOP and glaucoma. Acta Ophthalmol 1991;69:569–73. Kjorsvik S, Rossvold I. The middle-Norway eye-screening II. Prevalence of simple and capsule glaucoma. Acta Ophthalmol 1991;69:273–80. Ringvold A, Blika S, Elsas T, et al. Increased occurrence of exfoliation in the male, Spanish American population of New Mexico. J Am Optom Assoc 1992;63:643–8. Konstas AGP, Jay JL, Marshall GE, et al. Prevalence, diagnostic features, and response to trabeculectomy in exfoliation glaucoma. Ophthalmology 1993;100:619–27. Hirvela H, Luukinen H, Laatikainen L. Prevalence and risk factors of lens opacities in the elderly in Finland. Ophthalmology 1995;102:108–17. Rouhiainen H, Terasvirta M. Presence of pseudoexfoliation on clear and opacified crystalline lenses in an aged population. Ophthalmologica 1992;204:67–70. Alfaiate M, Leite E, Mira J, et al. Prevalence and surgical complications of pseudoexfoliation syndrome in Portuguese patients with senile cataract. J Cataract Refract Surg 1996;22:972–6. Wang L, Yamasita R, Hommura S. Corneal endothelial changes and aqueous flare intensity in pseudoexfoliation syndrome. Ophthalmologica 1999;213:387–91. Lumme P, Laatikainen L. Exfoliation syndrome and cataract extraction. Am J Ophthalmol 1993;116:51–5. Kuchle M, Amberg A, Martus P, et al. Pseudoexfoliation syndrome and secondary cataract. Br J Ophthalmol 1997;81:862–6. Schlotzer-Schrehardt U, Kocar MR, Naumann GOH, et al. Pseudoexfoliation syndrome: ocular manifestation of a systemic disorder? Arch Ophthalmol 1992;110:1752–6. Streeten BW, Dark AJ, Wallace RN, et al. Pseudoexfoliative fibrillopathy in the skin of patients with ocular pseudoexfoliation. Am J Ophthalmol 1990;110:490–9. Streeten BW, Li Z-Y, Wallace RN, et al. Pseudoexfoliative fibrillopathy in visceral organs of a patient with pseudoexfoliation syndrome. Arch Ophthalmol 1992;109:1757–62. Mitchell P, Wang JJ, Smith W. Association of pseudoexfoliation syndrome with increased vascular risk. Am J Ophthalmol 1997;124:685–7. Schumacher S, Schlotzer-Schrehardt U, Martus P, et al. Pseudoexfoliation syndrome and aneurysms of the abdominal aorta. Lancet 2001;357:359–60. Damji KF, Bains HS, Stefansson E, et al. Is pseudoexfoliation syndrome inherited? A review of genetic and nongenetic factors and a new observation. Ophthalmic Genetics 1998;19:175–85. Schlotzer-Schrehardt U, von der Mark K, Sakai LY, et al. Increased extracellular deposition of fibrillin-containing fibrils in pseudoexfoliation syndrome. Invest Ophthalmol Vis Sci 1997;38:970–84. Aasved H. The geographical distribution of fibrillopathia epitheliocapsularis, so-called senile exfoliation or pseudoexfoliation of the anterior lens capsule. Acta Ophthalmol 1969;47:792–810. Forsius H. Prevalence of pseudoexfoliation of the lens in Finns, Lapps, Icelanders, Eskimos, and Russians. Trans Ophthalmol Soc UK 1979;99:296–8. Kozobolis VP, Papatzanaki M, Vlachonikolis IG, et al. Epidemiology of pseudoexfoliation in the island of Crete (Greece). Acta Ophthalmol Scand 1997;75:726–9. Mccarty CA, Taylor HR. Pseudoexfoliation syndrome in Australian adults. Am J Ophthalmol 2000;129:629–33. Nouri-Mahdavi K, Nosrat N, Sahebghalam R, et al. Pseudoexfoliation syndrome in central Iran: a population-based survey. Acta Ophthalmol Scand 1999;77:581–4. Ye T, Mao W, Zhang J. Pseudoexfoliation syndrome in Chinese. Jpn J Ophthalmol 1989;33:300–10. Meyer E, Haim T, Gidoni O, et al. Pseudoexfoliation: epidemiology, clinical and scanning electron microscopic study. Ophthalmologica 1984;188:141–7. Woo J, Ho SC, Yuen YK, et al. Prevalence and effectiveness of treatment for hypertension on cardiovascular morbidity and mortality in an elderly population aged 70 years and over. Arch Gerontol Geriatr 1997;25:159–65. Janus E. The Hong Kong Cardiovascular Risk Factor Prevalence Study Group. Epidemiology of cardiovascular risk factors in Hong Kong. Clin Exp Pharmacol Physiol 1997;24:987–8. Gross FJ, Tingey D, Epstein DL. Increased prevalence of occludable angles and angle-closure glaucoma in patients with pseudoexfoliation. Am J Ophthalmol 1994;117:333–6. Lai JSM, Liu DTL, Tham CCY, et al. Epidemiology of acute angle-closure glaucoma in the Hong Kong Chinese population: prospective study. Hong Kong Med J 2001;7:118–23. Leibowitz HM, Krueger DE, Maunder LR, et al. The Framingham Eye Study monograph. Surv Ophthalmol 1980;24 (suppl):335–610. Klein BEK, Klein R, Lee KE. 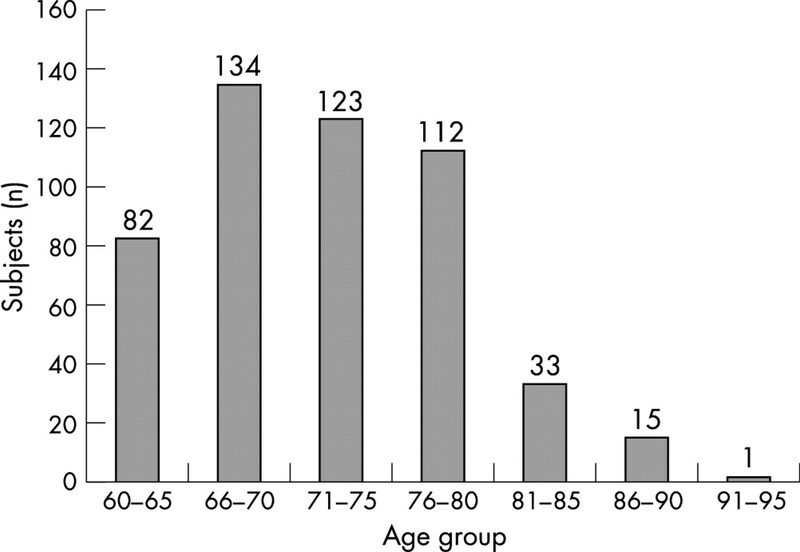 Incidence of age-related cataract. The Beaver Dam Eye Study. Arch Ophthalmol 1998;116:219–25. Sperduto RD, Hiller R. The prevalence of nuclear, cortical and posterior subcapsular lens opacities in a general population sample. Ophthalmology 1984;91:815–18. Leske MC, Connell AMS, Wu SY, et al. Prevalence of lens opacities in the Barbados Eye Study. Arch Ophthalmol 1997;115:105–11. Koliakos GG, Konstas AG, Schlotzer-Schrehardt U, et al. 8-Isoprostaglandin F2a and ascorbic acid concentration in the aqueous humour of patients with exfoliation syndrome. Br J Ophthalmol 2003;87:353–6. Koliakos GG, Konstas AG, Schlotzer-Schrehardt U, et al. Ascorbic acid concentration is reduced in the aqueous humor of patients with exfoliation syndrome. Am J Ophthalmol 2002;134:879–83. Yalaz M, Othman I, Nas K, et al. The frequency of pseudoexfoliation syndrome in the eastern Mediterranean area of Turkey. Acta Ophthalmol (Copenh) 1992;70:209–13. Moreno Montanes J, Alcolea Paredes A, Campos Garcia S. Prevalence of pseudoexfoliation syndrome in the northwest of Spain. Acta Ophthalmol (Copenh) 1989;67:383–5. Krause U, Tarkkanen A. Cataract and pseudoexfoliation. A clinicopathological study. Acta Ophthalmol (Copenh) 1978;56:329–34.